The mere headline will undoubtedly get some raised eyebrows from those who know me best: my family! Mari has actually learned a lesson (or two) from that pitiful 6′ x 10′ area that she calls a garden, which is next to the concrete slab that she calls a patio?! YES! You see, my mom and my sister are master flower gardeners. My mom thoroughly enjoyed the spring, summer and fall of the Chicago area with the celebration of color in our annual and perennial flower garden (read my previous posts of ‘She’s Quite a Lady!’). My sister Debbie grabbed onto that interest and took classes at Morton Arboreteum, eventually starting her own landscape design business. Meanwhile, I learned to clean. Somebody had to take care of the inside responsibilities! So cleaning details were my responsibility while Mom and Debbie were outside, happily making the side yard beautiful. 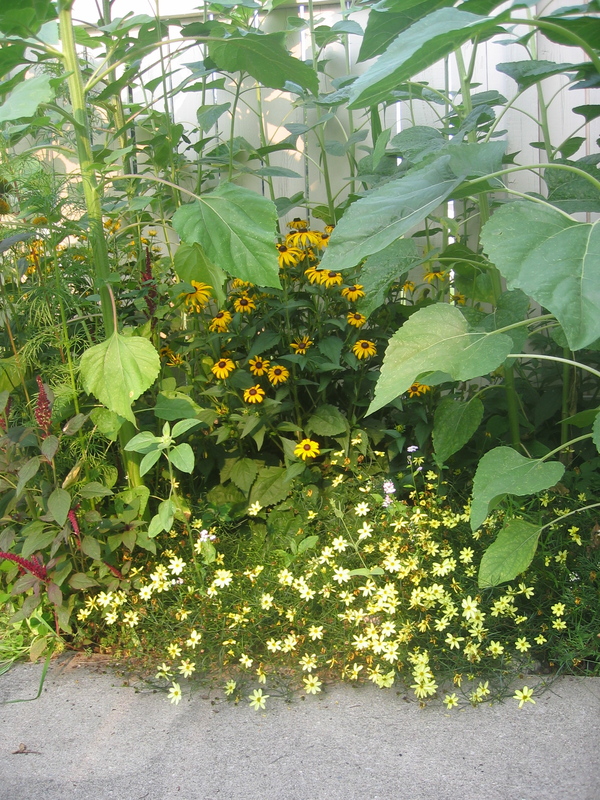 Several years ago Ed (my husband) decided that he wanted to plant something in the small plot of dirt that we had. In consultation with Debbie, he amended the soil in the fall. He dug out the dirt to a depth of 18″ and mixed that pile with Debbie’s recommendation of xyz. He replaced it into the area, and the winter snow covered it nicely. 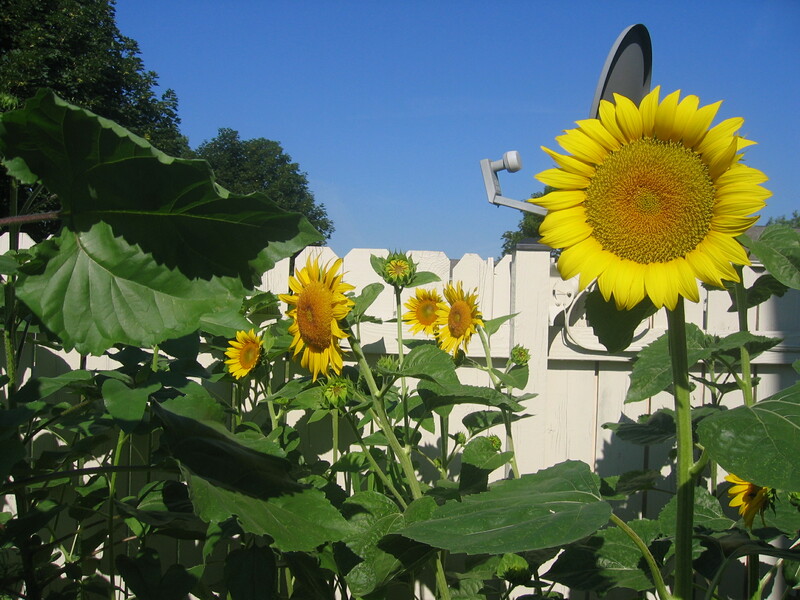 Ed planted sunflower seeds that first year, as well as several grasses, black-eyed susan and daisy plants. Ed had amended the soil so well, the giant sunflowers catapulted to the window sill of our second floor office! 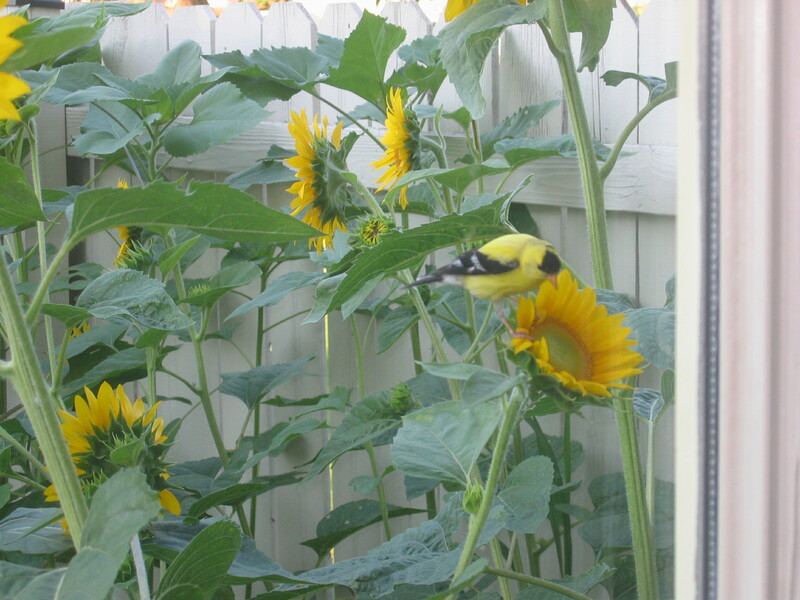 The flowers were huge, drooped pretty quickly, but the birds and squirrels loved them! It was awesome to know that those plants actually were growing in our little garden! Another year Ed sprinkled wildflower seeds- that was a wild year- and that brings us to this spring, 2010. We decided we weren’t going to plant anything specific, just let the garden grow on its own. By the end of July, it looked like a jungle! We were almost afraid to open the blinds in the morning to see the growth. Ed was headed out of town, so I determined to clean up the garden on Saturday morning. Here’s a starting photo of the project. Yikes! 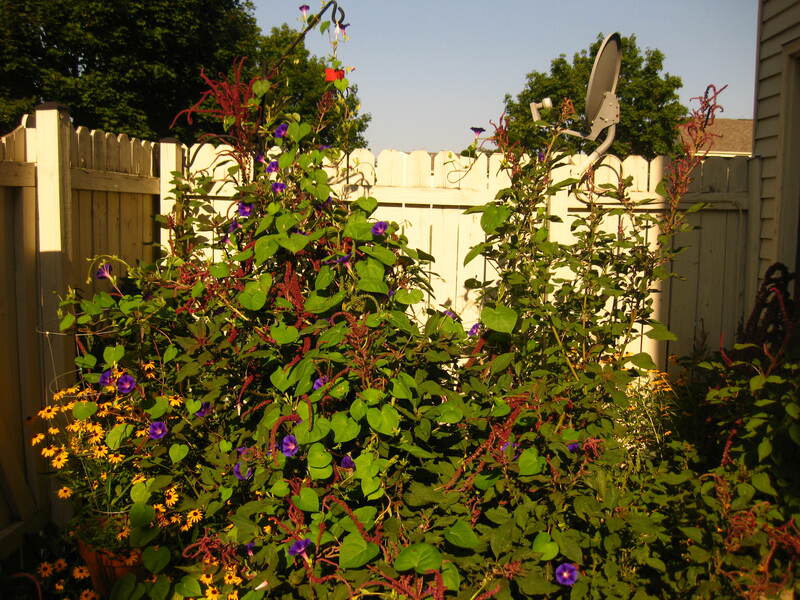 Our garden is a great object lesson that left to itself, matter does not rearrange itself into order! (Seems like that is a Law of Thermodynamics.) Chaos begets chaos! I had to not only make a decision to change the appearance- I had to take some action! Is there a lesson here about my life, about the lifestyle that I would like to have?